Back in October, you may recall the Mojito Madness Tour I went on with Tasting Tampa. Well, our friends are at it again. On Saturday, January 19th, the first annual Tampa Cocktail Countdown Tour will be taking place. The lineup of restaurants participating are sure to bring out their big guns and cocktail shakers for this event. Pelagia Trattoria, Grille One Sixteen, Datz, Ciro's Speakeasy & Supper Club and Zen Bistro International Plaza. I unfortunately will be missing out on this tour, as I will be coming back into port that day from a 6 day cruise (liver detox time). 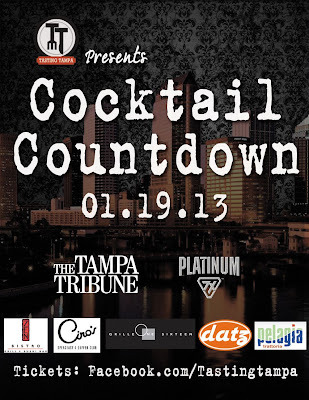 Make sure to follow Tasting Tampa on Facebook, they will be releasing tickets this week and they are sure to go fast. If you get a ticket, let me know! I cannot wait to hear about this experience.